Murder Charges Against Pakistan's Musharraf Are Unprecedented : The Two-Way The former president and army chief is accused of murder. It's alleged that he did not give adequate protection to former Prime Minister Benazir Bhutto, who was assassinated in 2007. Now, a court has taken the unprecedented step of indicting a former leader in a nation dominated by the military. The indictment Tuesday of former Pakistani President and army chief Pervez Musharraf on murder charges connected to the 2007 assassination of former Prime Minister Benazir Bhutto is an unprecedented exercise of power by a civilian court in a country long dominated by the nation's military, NPR's Abdul Sattar reports from Islamabad. Musharraf was "charged with murder, conspiracy to murder and facilitation of murder," Abdul reports. "The ex-general denied all the charges." As the BBC's M. Ilyas Khan adds, "in a country where the military has controlled political power directly or indirectly for most of its 66-year history, no civil court has ever charged a service head with a political crime. ... The case is now taking its due legal course, and we can safely say that it was the judiciary that actually went after him. The motive may be revenge, according to some, because of Mr Musharraf's attempts to sack the entire higher judiciary in 2007. Or it could simply be an opportunity to break new ground in Pakistan's legal history by arraigning a former army chief." Former Pakistani President Pervez Musharraf in April, near his home in Islamabad. "The case against Mr. Musharraf is believed to rest largely on a statement by Mark Siegel, a Washington lobbyist and friend of Ms. Bhutto's, who says that Mr. Musharraf made a threatening phone call to her before she returned to Pakistan in October 2007. Ms. Bhutto was killed in a gun and bomb attack as she left a rally in Rawalpindi in December 2007. "Mr. Siegel said Ms. Bhutto had warned him in an e-mail that if she were killed, the blame should fall on four named people — a former director of the ISI spy service, a military intelligence agent, a political rival, and Mr. Musharraf. Otherwise, the prosecution has not made the basis of the charges against Mr. Musharraf public. "As Pakistan plunged into turmoil after Ms. Bhutto's killing, Mr. Musharraf's government quickly blamed Baitullah Mehsud, the former head of the Pakistani Taliban, for the murder. Weeks later, the then-head of the C.I.A., Michael V. Hayden, agreed with that assessment." 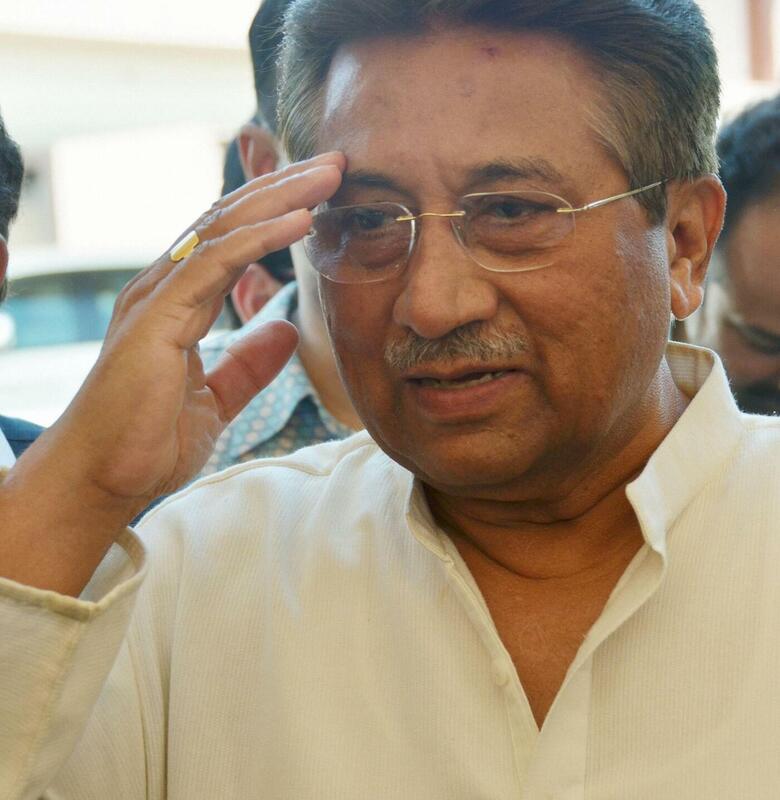 The AP adds that "prosecutors have said Musharraf ... failed to properly protect [Bhutto]." Along with Musharraf, "four suspected militants and two senior police officials" were indicted Tuesday, the BBC says. Musharraf, who returned to Pakistan in March after nearly four years outside the country, left the court Tuesday for his home outside Islamabad, where he has effectively been held under house arrest for months.